Psalm 23:1 - The Lord is my Shepherd; I shall not want. Color the Psalm 23 Poster . Glue onto a piece of construction paper. - Lamb Puppet - Cut out the pieces on the template. Glue the head to the bottom of a white paper sack. Glue legs to the sides and opening (be sure to glue the legs so that the hand will not cover them up). Glue the tongue inside the fold. Roll thin strips of white paper around a pencil to curl. Glue as wool on the lamb’s head. - Make a lamb handprint. Paint the palm and fingers of the hand black. Press down on a piece of paper with the fingers parallel and the thumb outstretched. Glue cotton balls on the palm and part of the fingers. Add eyes, a mouth, and ears on the thumb for the lamb's face. Add the title "The Lord is My Shepherd." - Paper Bag Lamb - Cut out the pieces on the template. Open up the paper bag and fill with newspaper. Fold over the end and tape to close. On the bottom of the sack, glue the lamb face. Glue the legs to the sides of the bag. Add a cotton ball tail on the folded top of the bag. - Make a Lamb Mask: Cut out the lamb and glue to a paper plate. Glue popped popcorn on the “wool” part of the picture between the ears. Tape or glue on a large popsicle stick to the back of the paper plate. 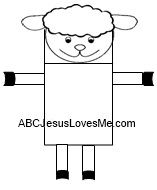 - Color the Jesus and the Lamb Coloring Sheet using fingerpaint. 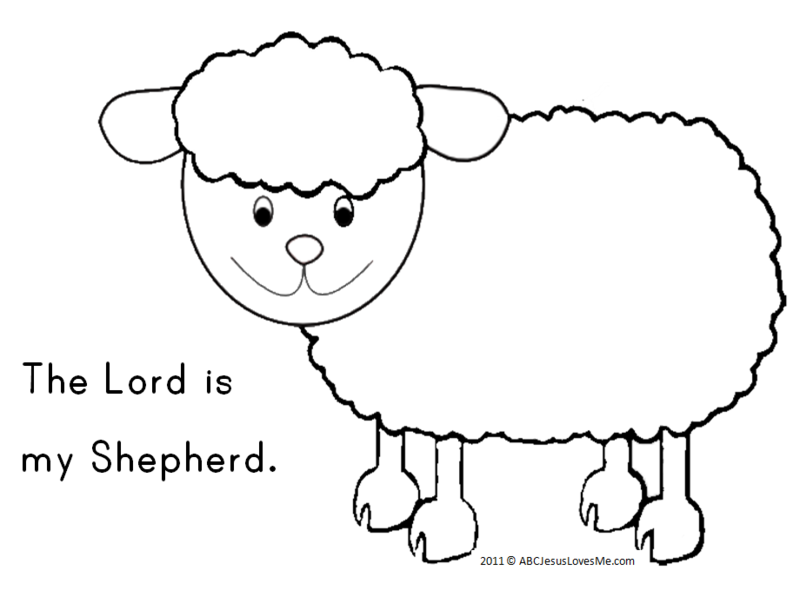 - Print the My Shepherd Loves Me Forever coloring sheet on cardstock. With a hold punch, punch holes around the heart. Using pipecleaners, make two staffs. Place the staffs over the heart. Lace the pipecleaners down onto the heart. Discuss how the Shepherd loves His sheep. - Make Shepherd's Staffs: Using breadstick dough or sugar cookie dough, roll the dough into a "snake" and bend the end to make a staff. 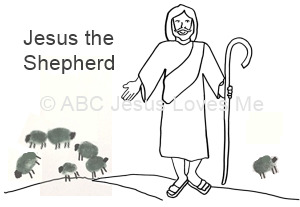 - Color the Jesus the Shepherd coloring sheet. 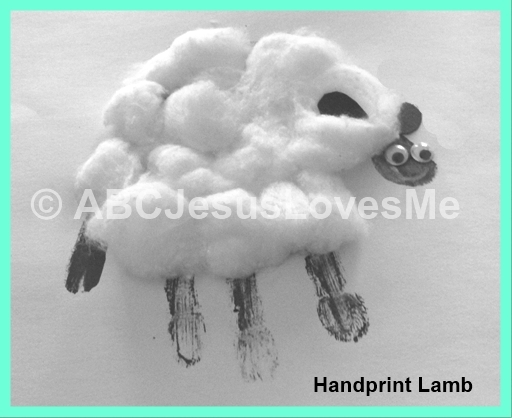 Using a white or black ink pad, stamp thumbprint lambs on the poster. Add a head, legs and a tail to the lambs. Glue to a piece of construction paper. 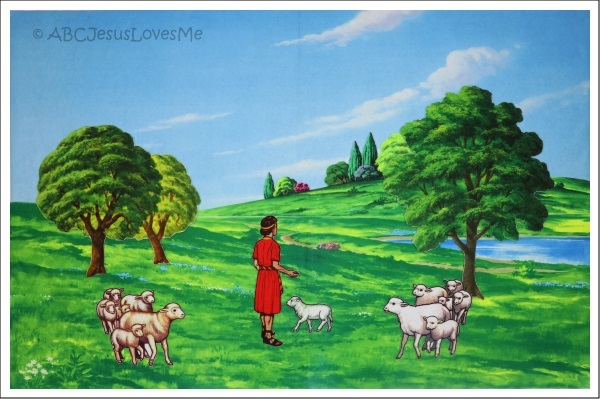 Add the title "My Shepherd is Always with Me." 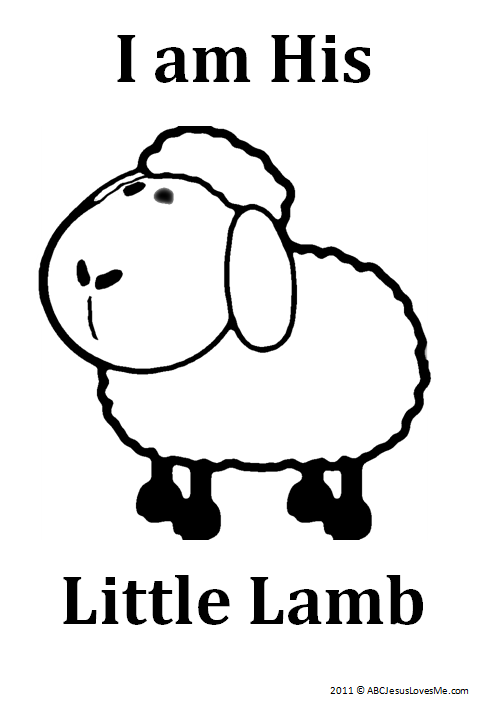 - Use the "I am His Little Lamb" as a title page and staple or bind all of the pages together to form a book. Review the Bible stories as you look through the finished book. - Use or make an Etch-a-Sketch to demonstrate how God erases our sins when we ask for forgiveness. In a ziptop bag, place 1/2 cup hair gel and 2 tablespoons of tempera paint (you may also add glitter). Seal the seams with clear packing tape. Mix together. With the bag sitting on a solid surface, use a popsicle stick to "draw" on the bag. Simply flatten to erase.